We have decided to do a few projects around the condo and the first one started with getting our entry way floors refinished right before the Fourth. Because we had to get out of the house we made a special trip to our friends the Shumway's house in Wells, Maine. This is one of our favorite places in the world! The best part of the trip this time was getting to spend time with our new friend Carly Nicoletta Shumway. I maximized the baby snuggle time for sure! The kids dug in the sand, splashed in the water, played sports and just ran and ran and ran! They are so happy here their smiles are contagious. There isn't a better way to relax. Even Regina seems to smile! Dawn took the kids out for a day adventure and they obviously had fun. I take a lot of pictures to get the few good ones I keep. For some reason the kids were all smiles this day and there were many more good pictures that I didn't pick to put up here. First the kids went to the waterfront to catch the boat to Charlestown. While in Charlestown they found a huge new playground that also has a water park. They plan to go back there another day to get wet. After taking the boat back to Boston they hit the Aquarium. Not bad for one days worth of activities. So Chris and I were lucky enough to get away for 2 whole nights thanks to the generosity of Dawn and Erin and Matt! They are amazing and boy did we enjoy ourselves. We stayed at the Woodstock Inn in Vermont and relaxed and enjoyed the quiet. We of course missed our little rug rats, but the spa and golf course helped easy our pain. We enjoyed fancy dinners, slept in (until 7:30! ), adult conversations and even hit the raquet and fitness club a few times. 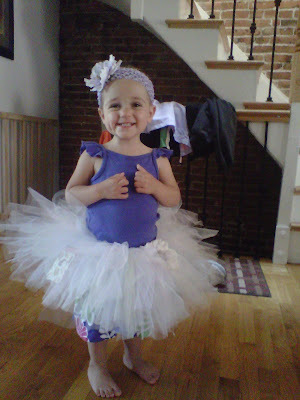 Check out this adorable outfit from Aunt Erin and Uncle Matt.....do you think she likes it? Richie can name EVERY player on the Red Sox just by looking at a small picture of the their face. I tested him and he got them ALL right. I guess it helps when you pay this much attention when you go to the game! 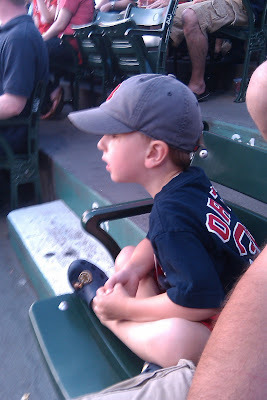 Another fun day at Fenway had by all. Father's Day was the end of a dog sitting weekend in our house. We had Moxie and Maggie and had so much fun with them. Chris wanted to go hiking so we packed up the crew and headed out to the Fells. Richie hiked the whole time himself and Angela did for a long time as well. While we were there the dogs gave themselves some mud boots and the kids had a treasure and animal hunt. Unfortunately we had a quick exit when we saw a snake eating a frog.....the kids were not happy and we had to explain some life lessons. UGH! Everyone can enjoy a late afternoon cocktail. Cranberry lime rickey's for all. It was a sad day to be finishing up baseball. These have been Richie's favorite Saturday mornings. Coach Dom was a trip, but the kids did learn a lot. Today was a kids/parents game. In the middle of practice we ran to the Bruins parade and then ran back in time to see the kids beat the parents (8-2 is what Richie says!). After practice Coach bought us all pizza and we had a cake to celebrate this birthday. We have also spent these days getting to know the Hamwey's better. They are my friend Mary Beth from high school's family. Vivian was on Richie's team and you can see Angela with her friend Charley (Caroline). Older sister Brigid was at the parade, but usually she reads her way through practice. We can't wait for some trips to the pool with them again this summer. You can also see a pretty good hit in the video below. Richie was the best hitter on the team BY FAR! Pretty proud of himself. 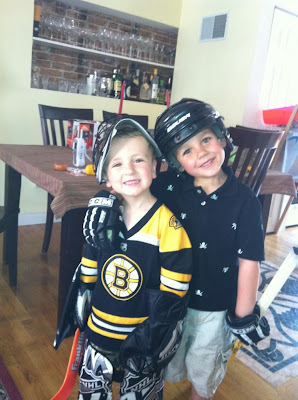 With the Bruins parade starting just a few blocks from our house we were not about miss it. It happened to fall during baseball practice so we changed shirt/hats and ran over to the Garden. It was a crazy mob scene, but the kids got to see the Duck Boats and the Cup! Check out our cool friend Nate Harding and his Stanley Cup t-shirt. Richie and Chris got their fair share of gear as well. And as we were leaving we saw a Cup we were able to touch. Some kid was very proud we wanted a picture with his creation! 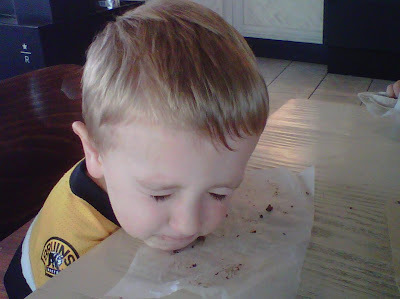 Sometimes you just need to rest your eyes in your donuts crumbs when you have had a long night of hockey. I assume all of you watched game 7 of the Stanley Cup in this garb, correct? Well at least one little boy did. Stayed up until 10 pm which meant he saw 2 whole periods. He could rest easy because they were up by 3. And when he woke up the next day he didn't want to hear the score or know who won. He wanted to watch it himself. So at 7 am we watched the third period again. 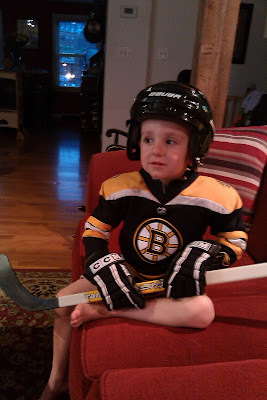 He is now over the moon, cheering and playing hockey (way too early for our downstairs neighbor!). Angela took one look at the Stanley Cup on TV and deemed it the Stanley Cupcake! Some have to wait a lifetime to see their team win the cup. Others get to see it when they are four. We can't wait to get some new t-shirts and see the parade. Daddy went away fishing with Grandpa so Babci came to visit. She got to see Richie's baseball practice, we had lots of fun dinners and we had movie night. Angela got Tangled from Colton for her birthday and the kids have watched it every chance they get! Is there anything better than getting to spend the day with your best friend on their birthday? We were lucky enough to have lunch and play time with our bud Colton. We went to Beer Works of course (the boys favorite) and then back for some hockey. Happy 5th Birthday Colton! How can our babies be getting so big?? I got wind of a tall ship down at Rowe's wharf so I grabbed the kids and we headed down there to catch a glimpse. I didn't know what to expect so we were beyond impressed when we caught our first sight of the boat. It was a tall ship from Columbia called the Gloria and it was HUGE. We were allowed to climb all over the ship and the kids were really into it. Richie did a great job of getting himself up and down some narrow steep staircases because I had Angela. The Columbian Naval Officers were so sweet even though there was well over a hundred people to contend with on their boat. Just another reason I love living in the city. So glad we took the time to walk down there. And yes, Richie carried a pink purse with him for the walk there and back. He got some serious looks in his camo cargo pants, blue football shirt, white Ray Bans and his hot pink purse. 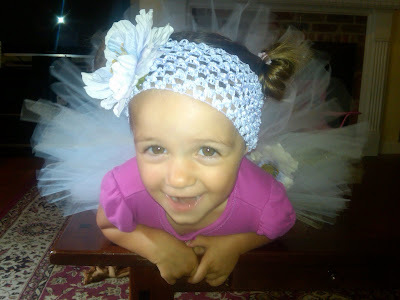 Well it is official...my baby is 2 and we had such a fun day with her. I was super worried about what to do for her birthday because I just didn't know what her favorite things were. Everything seemed to be things her brother liked that she liked by default. But as you can see by the look on Angela's face in all of these pictures I think she had a blast. She woke up to the house decorated all in purple and a pancake in the shape of a 2. After opening some presents we got dressed and went to the zoo. Every animal we came upon was her new favorite until the gorillas. The new baby gorilla stole all of our hearts! At the gift shop Angela went home with a stuffed purple gorilla. We came back to the neighborhood for a birthday lunch with Dawn and more presents. 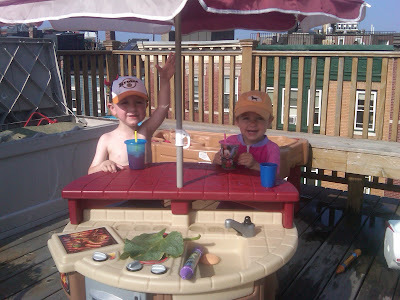 After nap we went to the roof to reveal our present (an outdoor kitchen/bbq/table) on the roof. We finished the day playing up there and then purple cupcakes!